This sesame candy is one of my favorite treats from Mama Lin. It is so easy to make. 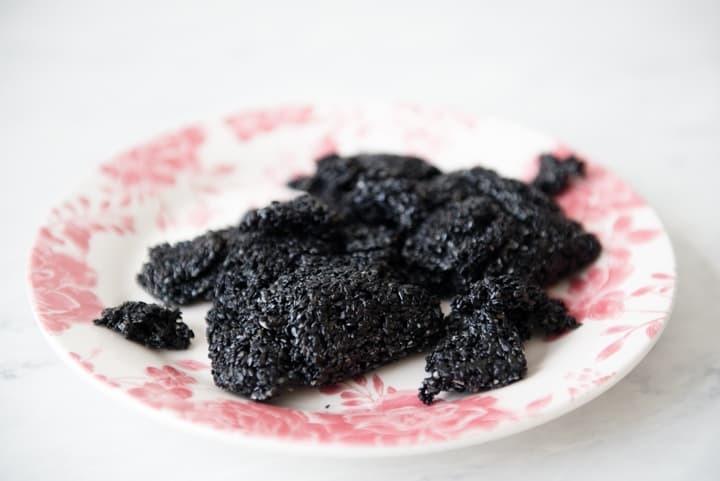 All you need are 5 basic ingredients: sesame seeds, black sesame seeds, sugar, honey, and oil. 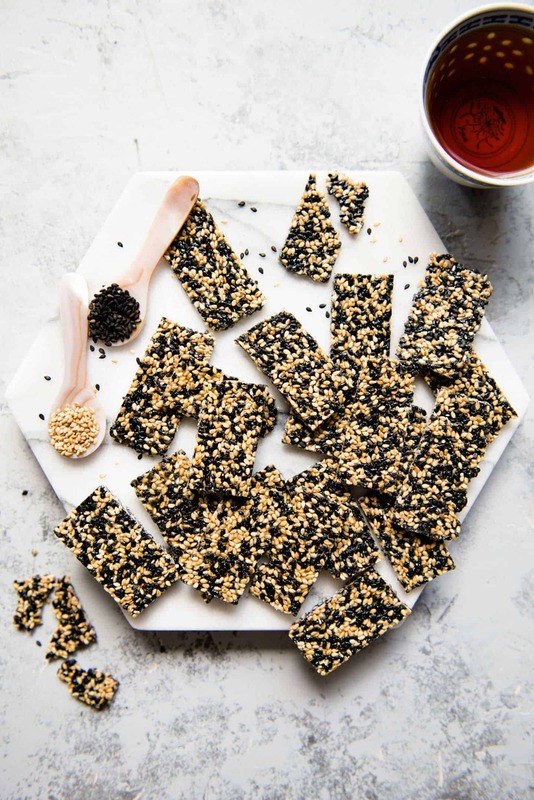 A candy thermometer is not required for this sesame candy recipe. Mama Lin is known for making sesame candy and peanut candy and giving it away to friends. Every Christmas, my husband and I lug a big tub these candies to England for my in-laws. Everyone loves eating these candies! My mother’s candy is popular because they have a good crunch and they are not overly sweet. I have eaten so many store-bought candies that are so sweet that they practically make my teeth fall off. That’s why I never buy them. However, I can eat Mama Lin’s candy any day. 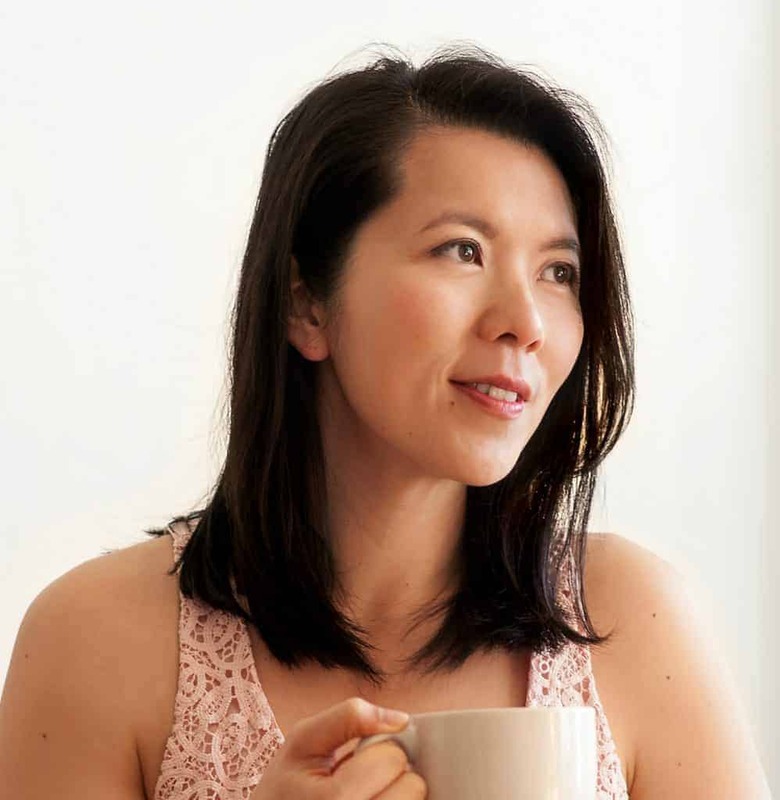 I finally learned Mama Lin’s sesame candy recipe, and I am excited to share it with you! 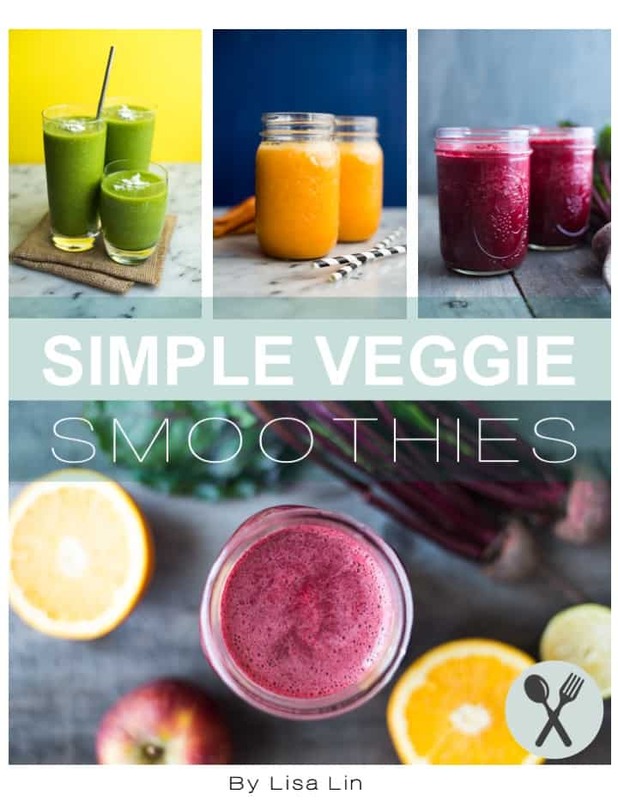 It is so easy to make, you definitely need to try it! You do not need a candy thermometer: All you need to do is melt the sugar with the honey and oil for a few minutes. Once the sugar dissolves completely and the melted sugar mixture is like the consistency of maple syrup, turn off the heat. Toss the sesame seeds into the syrup. 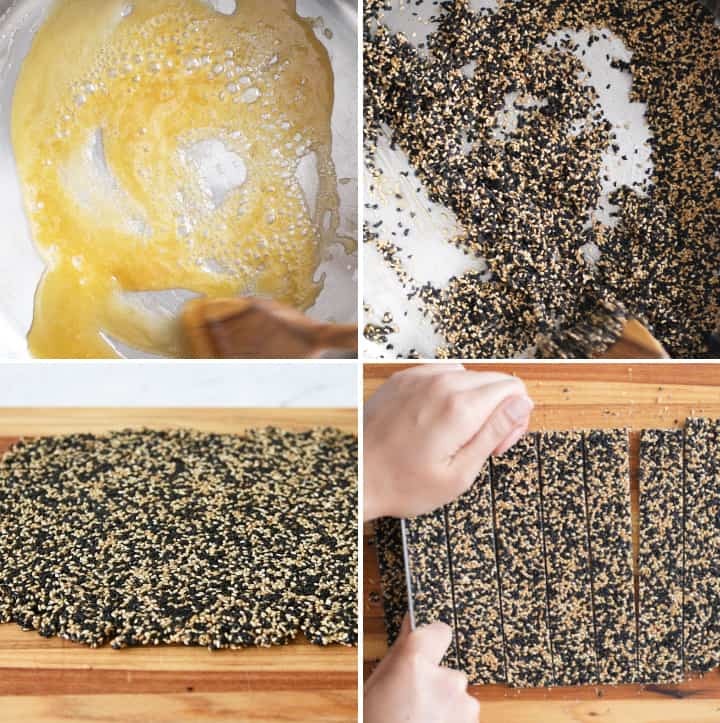 Work quickly: The sugar mixture hardens quite quickly, so you want to work quickly to transfer the mixed sesame seeds onto a silicone mat and roll it out. Otherwise, you will not be able to roll out the sesame candy into a thin layer. 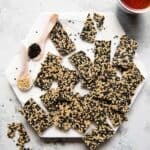 CAN I MAKE THIS SESAME CANDY WITH HONEY ALONE? I would advise against making the candy with just honey because the candy will not harden. In a day or two, all of the sesame candy will lose its shape and you’ll be left with a mass of sesame seeds. Mama Lin tested a batch of sesame candy using only 2 tablespoons of sugar and 3 tablespoons of honey. Although it tasted fine, but the candy could not hold the shape (see photo below). The reason for the honey in the recipe (besides adding flavor to the sesame candy) is to help the sugar melt faster. Also, the honey buys you a little more time when you roll out the candy and slice it. Mama Lin used corn syrup in place of honey before, and the candy tastes fine too. WATCH ME MAKE IT WITH MAMA LIN! 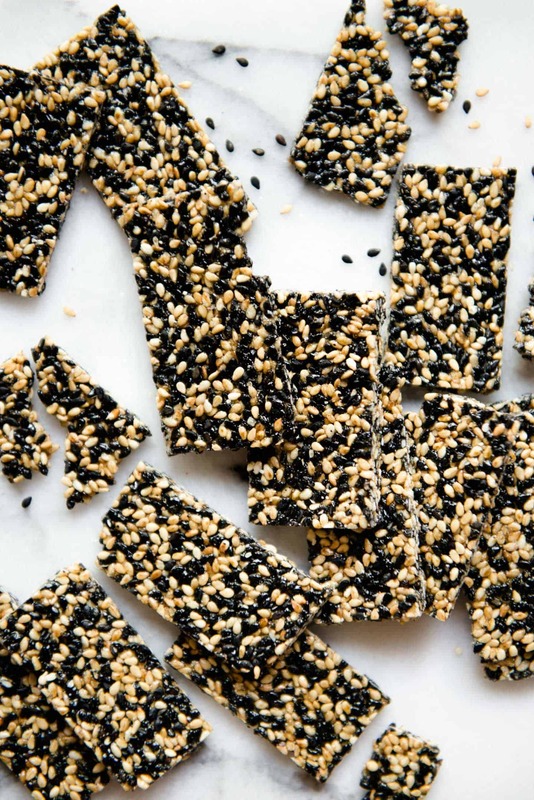 This delicious sesame candy will keep for several weeks! Lay a silicone mat on your work surface. You will use this for rolling out the sesame candy. Pour the black sesame seeds into a large pan and toast them on medium-high heat for about 3 to 4 minutes, stirring frequently. Because of their black color, it may be difficult to tell when the sesame seeds are done toasting. The sesame seeds usually release a faint aroma when they are ready. You can also see wisps of smoke coming from the sides of the pan. Turn off the heat and transfer the sesame seeds to a bowl. Next, toast the plain sesame seeds for 3 to 4 minutes, stirring occasionally. Transfer the toasted seeds to the bowl with the black sesame seeds. Mix the two types of seeds together. In a large stainless steel pan, add the oil, honey, and sugar over medium heat. Stir everything together and wait for the sugar to dissolve completely. This will take several minutes, and the syrup should be runny. Make sure to stir frequently to keep the sugar from burning. Once the sugar dissolves, turn off the heat. Add the sesame seeds and stir to coat the seeds with the syrup. Working quickly, pour the sesame seeds onto the silicone mat. Try to pile all the seeds into one mass. Lay the other silicone mat over the seeds and press down gently. Use a rolling pin to roll out the sesame candy. You want to make sure to be quick here so that you can roll out the candy into a thin layer. Lift up the top silicone mat. Lay a chopping board over the candy. Carefully flip the candy onto the chopping board. Remove the silicone mat. Use a sharp knife to trim the sides of the sheet of sesame candy so that you get straight edges. Cut the candy sheet into 1-inch strips of candy. Cut each strip into candies about 1 1/2 to 2 inches long. Don’t worry if your candy isn’t uniform in size. Mine are never perfect. You can enjoy the candy immediately. The candy will continue to harden as it cools to room temperature. Once cooled, store the candy in an airtight container for several weeks. I like toasting the sesame seeds right before making the candy, regardless of whether they have been previously roasted. This releases more nutty flavors. If you are using roasted sesame seeds, and you’re feeling lazy, you can skip this step. I mixed the black and white seam seeds before toasting. Then its easy to see when they are done. I also added a little sea salt to the seam mixture. Yummi!! Oh, LOVE that you added sea salt to it! Your sesame candy recipe turned out great and was so easy to make. I plan to make more for Christmas gifts this year. Thank you Lisa and Mama Lin! Thank you, Lorene!! Glad you enjoyed it!! Can I use parchment if I don’t have silicone sheets?